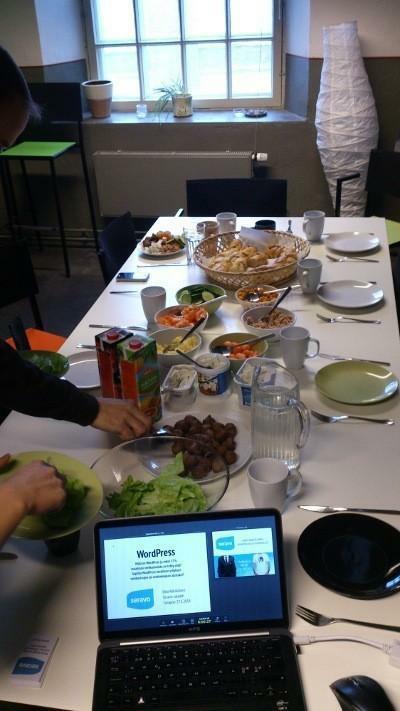 Seravo salad is a monthly event where we discuss relevant subjects related to open source and the Internet, while the attendees enjoy a healthy salad lunch. The event is organized in cooperation with Hub Tampere. Thu 27.2.: What is WordPress and why are 17 % of the websites in the world done using it? Is WordPress a suitable platform for a normal company website or online store? Thu 27.3.: Open Document Format – the safest file format for you documents. What it is, why should you use it and what has LibreOffice and Google Docs to do with it? Thu 24.4.: what is CiviCRM and why do over 8000 organizations world wide use it to support their operations, among others as a membership registry and a fund raising tool? Thu 22.5.: How does OwnCloud work and is it a NSA-safe way to store and share files online? The event is in the kitchen of Hub Tampere (mostly) every last Thursday of each month at 12:00 and lasts as long as a lunch normally lasts. The presentations and the general discussions following it are usually in Finnish. If you work close to the city center of Tampere and speak Finnish, please join us to learn about free (as in free lunch) and open source software and its applications in business! For more information visit Hub Tampere event page or see the attached flyer. Katso myös suomenkielinen esite ja tapahtumakuvaukset COSS.fi:ssä: WordPress, Open Document Format, CiviCRM ja OwnCloud.